Why Aren’t There More Blond Heroines in Fantasy? Source: Why Aren’t There More Blond Heroines in Fantasy? 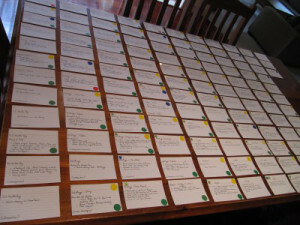 Lots of authors use index cards to map their plot, create scenes and work out structure or scene placement. Last week I used a similar exercise to track my novel’s progress using index cards, preparatory to restructuring the manuscript. First: I wrote up every scene/story break in my novel. I was gobsmacked to find there were one hundred and twenty four scenes. Is that way too many? They seemed appropriate during the writing. But since it sounded so many, I went to my bookcase and checked out lots of books. Some have few story breaks, but to my relief, others had lots and lots too. The aim of the exercise was threefold. 3. To enable me to juggle the scenes when I (shortly) experiment with the structure.